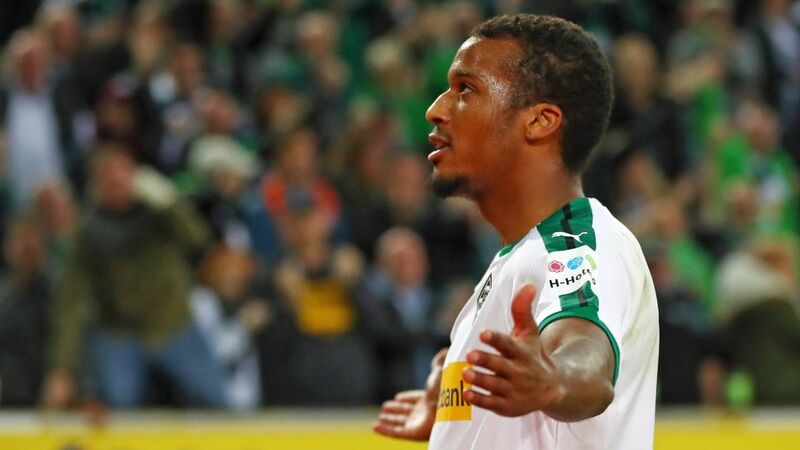 If Alassane Plea's first few months as a Borussia Mönchengladbach player are anything to go by, the Foals may well have landed themselves one of the signings of the summer, ahead of a host of English Premier League aspirants. The French striker has found the back of the net five times in the first seven games of the season, helping Borussia mount a charge for UEFA Champions League football next season, and he told bundesliga.com how happy he is to have rejected a move to England in favour of a sought-after switch to the burgeoning Bundesliga. bundesliga.com: Alassane Plea, how would you reflect on your first three months in the Bundesliga? Alassane Plea: I'm really excited about it. To start with, I was given a warm welcome by the club and I've managed to find my feet pretty quickly in the Bundesliga. I'm feeling happy and comfortable here every day, both on and off the field. It was the right decision to move to the Bundesliga. Of course it's flattering to hear that clubs from the Premier League were interested, but I desperately wanted to come to Germany because you get everything you need here to move onto the next level and improve. bundesliga.com: And what about the level of the football here? Plea: The Bundesliga's extremely competitive and everything in and around the Bundesliga's impressive too – almost every game is a sell-out and the atmosphere's great, with the fans extremely dedicated. I think the Bundesliga's on a higher level than Ligue 1, above all in terms of intensity. It's all very serious and professional even in the training sessions and nothing is left down to chance. I was a bit taken aback by this mentality and everybody's drive and determination in the first few weeks, but I'm really happy here. bundesliga.com: How are you settling into the team? Plea: Very well. Things have been made so much easier for me, while I'm fortunate to have many team-mates like Denis Zakaria, Ibrahima Traore, Thorgan Hazard, Yann Sommer, Mickael Cuisance and Mamadou Doucoure who speak fluent French. That helps a great deal, particularly in understanding the tactical instructions from the coach. But I get on well with all the others too, and I'm learning German. bundesliga.com: What do you make of your win at Bayern Munich, two weeks on? Plea: We were as solid as a rock in Munich. We didn't run any risks at the back and were a threat every time we went forward. That shows what potential we've got in attack, but it also highlights the self-confidence we've got and the form we're in. To win 3-0 at Bayern is an amazing achievement. Plea: That's true. I'm on the left wing when the ball comes to me and I take a pot-shot at goal, aiming to catch the goalkeeper out – and it worked. I had to hit the ball well and aim for the far post. It's something I work on in training, and it worked really well. Plea: In Mönchengladbach, but also under Lucien Favre at Nice, I learnt about tracking back immediately after losing possession in order to help my team-mates. Last season, I often played on the left wing and that's no problem for me – it's about being a modern forward. I love giving everything for the team and also having to do the dirty work. bundesliga.com: Next up are Mainz at Borussia-Park. Is there a risk that you might underestimate them after your win in Munich? Plea: I don't have any fear about that. We know too well what Mainz's strengths are and we'll come into this game with plenty of respect and also a lot of self-confidence. Every game's tough in the Bundesliga, no matter who you're playing against or whether you're at home or away. We want to confirm our current form with another three points and cement our place in the top third. We've got a squad made up of humble lads who keep their feet on the ground, which is why I'm absolutely convinced we'll take Mainz seriously. bundesliga.com: Is your aim to play in Europe with Borussia next season? Plea: We want to do as well as we can and if that gets us into Europe, then it would obviously be great to be able to travel Europe in 2019/20. We've got a great bunch of lads with huge potential, but the season's long and we just have to take things from game to game and try to get a winning streak going.